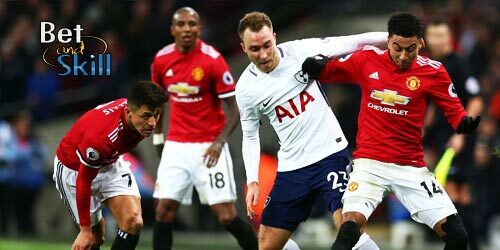 Manchester UTD host Tottenham in a Premier League lunchtime match that will get pulses rising among football fans across the globe this Saturday. Who will win? 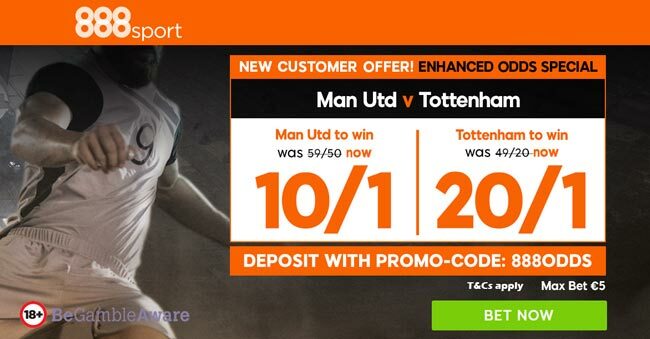 This article contains our Man UTD vs Tottenham betting preview with predictions, betting tips, starting lineups, team news, odds, betting offers and no deposit bonuses! Jose Mourinho believes Phil Jones will be okay to start after the defender was subbed last time out just after the 20 minute mark. Eric Bailly also looks available but he is likely to start on bench. Ashley Young may again be favoured over Matteo Darmian and Daley Blind at left-back while Antonio Valencia should continue at right-back. Paul Pogba Maraoune Fellaini and Michael Carrick look set to miss out again, leaving Jose Mourinho with few options in central midfield - Ander Herrera and Nemanja Matic. Marcus Rashford could get the nod over Anthony Martial on the left wing altugh he is not 100% fit. Juan Mata and Henrikh Mhkitaryan should complete the offensive midfield trio behind Romelu Lukaku, with Jesse Lingard as viable alternative. Tottenham looked in strong form after turning over Liverpool 4-1 in their last league game. They are unbeaten in their last five Premier League matches and also managed to earn a point at the Santiago Bernabeu against Real Madrid in Champions League. Anyway, the Spurs suffered the disappointment of going out of the Carabao Cup in midweek, surrendering a two-goal lead to lose 3-2 at home to London rivals West Ham on Wednesday. Pochettino's men defeated Man United 2-1 the last time the two sides met. Harry Kane was not risked against West Ham and has been ruled of for Saturday's match. This will see Christian Eriksen and Dele Alli occupy the advanced midfield positions in a 3-4-2-1 system behind Son Heung-min. Harry Winks should partner Eric Dier in the middle of the park, with Moussa Sissoko providing a further option. Danny Rose and Mousa Dembele made comebacks in midweek's match against West Ham but they are unlikely to feature from the off. Davinson Sanchez, Toby Alderweireld and Jan Vertonghen should keep their spots in the three-man defence. Victor Wanyama (knee) remains out, while Erik Lamela is lacking match fitness. "Manchester UTD vs Tottenham betting tips, predictions, lineups, odds and free bets (Premier League - 28.10.2017)"